I decided to ride my bike to the post office today. The temperature was a balmy 35 degrees and the sun was out. 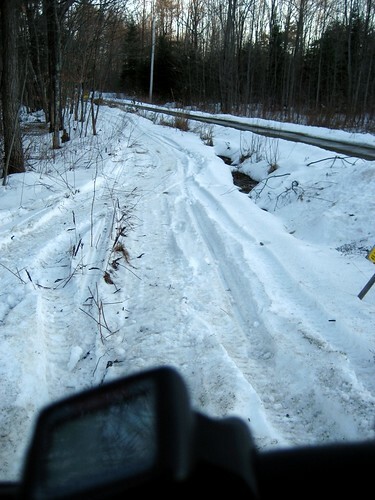 I checked out the snowmobile trail that leads to the other side of town. 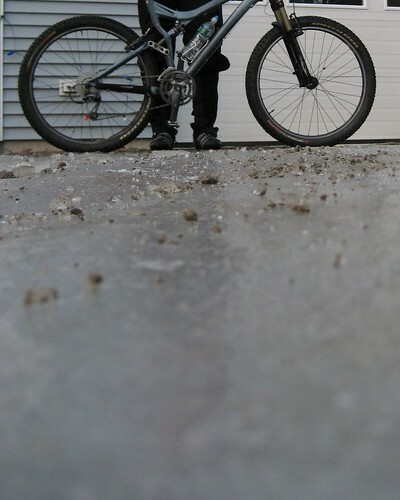 A little test walk showed that it was frozen enough to ride on top..Nice. I was cruising along nice and easy at about 10 mph when all of a sudden my front tire broke through the ice, then the back. I downshifted to try and dig my way through, but it was too mushy. I tried in vain to keep riding, but it was no use. Look closely and you can see my track in the mush. Luckily there was a side trail that leads back to the main road right next to me. I took a left and made my way back to the dry pavement. I pulled into the post office just before closing and picked up the mail. The most interesting mail item was a new Performance Bike catalog. I decided the catalog would be the perfect companion for a hot chocolate when I get home.